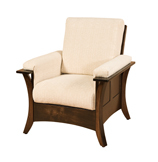 The bowed arm rests of this handsome chair are built for comfort. The chair's solid wood frame supports luxurious cushions, while slats finish the side. This is an heirloom chair that will be comfortable for years to come. Contact us if you would like to provide your own upholstery. Cushion springs are standard. Frames feature mortise and tenon construction for long lasting durability. Add the 20" Foot Stool for additional style and comfort. It's okay to sprawl on this relaxing chair. The bowed arm rests and the inclined back can handle it. This chair will help you love coming home even more. This chair features a three step reclining peg adjustment on the back. Contact us if you would like to provide your own upholstery. Cushion springs are standard. Frames feature mortise and tenon construction for long lasting durability. Chair may be purchased without the 20" Foot Stool. The Bow Arm Slat Chair has its back relaxed at the perfect angle, and arm rests curved for your comfort. The Mission-style sides boast handcrafted wood slats for heirloom comfort and style. A perfectly inclined chair with bowed arms is a grand way to relax. The solid wood chair has stylish side slats, and of course we came up with a foot stool that matches for an heirloom set. Pictured in qs white oak with Michael's Cherry stain and 31-17 Jaguar fabric. Floor to top of seat cushion - 20½"
Front of seat to back cushion - 19½"
Seat cushion to top of back cushion - 23"
Pictured in brown maple with FC7992 Asbury stain. Floor to top of seat cushion - 18¾"
Front of seat to back cushion - 19¼"
Seat cushion to top of armrest - 8"
Sofas and chairs are uniquely designed with removable arm rests. and is accomplished by simply removing several screws and bolts. Relax at the end of a hard day with your feet up in your throne. The thick cushions and padding on this chair are luxurious. The chair can be built with leather or another fabric choice if you'd prefer. 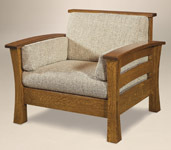 The arms have curve oak panels -- a detail that differentiates this chair from ones sold in big box stores. While other chairs have an attached leg rest, this chair has a separate ottoman. The sliding ottoman top is easy on sore joints at the end of a long day. 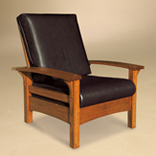 The Morris Chair in the Clearspring style is perfectly inclined. Relax your back and head on the adjustable chair back, while you spread your arms over the angled arm rests. Even the cushions come as supportive as you want them. Handsome side panels make this chair a luxury to sit in. This chair features a unique three step reclining peg adjustment on the back! Contact us if you would like to provide your own upholstery. Cushion springs are standard. Frames feature mortise and tenon construction for long lasting durability. The 20' Foot Stool comes standard but the chair may be purchased separately. Lay your head back, kick your feet up, and spread your arms over this ingeniously designed chair and foot stool. 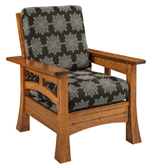 The inclined arm rests of this chair are the perfect complement to its adjustable Morris back. You can get lost in the comfort of this cubic chair. The cushions on all sides of the chair invite you to settle in, while the solid wood frame ensures your chair will be there for you for a long time. Create a stylish living room with the slats and cubic shape of this luxurious chair. Cushions on all four sides invite you to sink in. This hardwood chair is both beautiful and comfortable. The bold look and intricate detail of the Diamond Chair will bring a degree of luxury to your room you never thought possible. The Diamond Chair features a distinct traditional Mission shape that gives it a solid appearance that strictly adheres to the ninety degree rule Mission furniture is known for. Select upholstery from our site, or request special order upholstery from anywhere else! We can install any leather or fabric with the same master quality as the pieces are built with. Built with solid wood, and handcrafted from the best quality hardwoods found in the country. Spring cushions are standard. Customize your Amish chair using our drop down boxes at the top right of the page. Come sit down and relax. This inviting chair has an amicable shape with its curved arm rests and rounded cushions. The simple design looks and feels good anywhere in the home. Contact us if you would like to provide your own upholstery. Cushion springs are standard. Frames feature mortise and tenon construction for long lasting durability. Add the 20" Foot Stool for additional comfort and style. 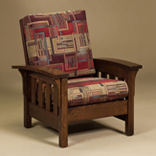 Combine the Durango style with with the comfort of the Morris design and you have a relaxing heirloom chair that will stay a household favorite for years to come. This chair features a unique three step reclining peg adjustment on the back! Contact us if you would like to provide your own upholstery. Cushion springs are standard. Frames feature mortise and tenon construction for long lasting durability. Add the 20" Foot Stool to your chair for additional style and comfort. The Empire Chair is short and upholstered for you to sink into. The back is angled while the arm rests are curved in a relaxing shape. This Mission-style armchair has slatted sides. Actual depth when fully upright is 36"
Depth when reclined with footrest out is 67"